With a very wet June across the country followed by a wet July, soil condition remains heavy & puggy in both the North and South Island’s. The heavy rain has been positive for Canterbury’s aquifers, which have been severely depleted over the last three years. The start of July saw heavy snow in Canterbury, followed by a good snow dump in the North Island in the middle of the month. Good cow condition has helped animals cope with the wet and cold weather. 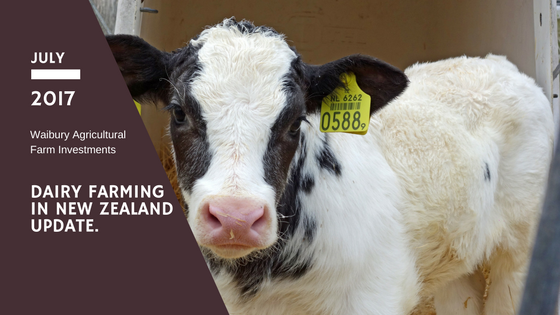 The beginning of July saw early calves arriving in the Waikato and regions further north. Calving season takes place between July-October and is one of the busiest times of the year for farmers. Bobby calves traded at the saleyards have attracted good money as the demand for dairy x animals continues from the beef sector. July auction results retained their holding pattern, with only a slight decrease in the overall index. Whole milk powder (WMP) prices lifted 2.6% to $US3111/tonne reversing the previous two auction price falls. Butter prices strengthened in the Oceania area, with values breaking through the NZ$8000/tonne barrier for the first time. ASB continue to predict a $6.75/kg milk solids result for the coming season.